Allwinner A80 based Rikomagic MK80 Android TV box, now has a Linux sibling with Rikomagic MK80LE (Linux Edition) running Ubuntu 14.04, and allegedly supports 2D/3D graphics acceleration, and hardware video decoding. Two versions are available MK80LE with 2GB RAM & 16GB Flash, and MK80LE Plus with 4GB RAM & 32GB flash. 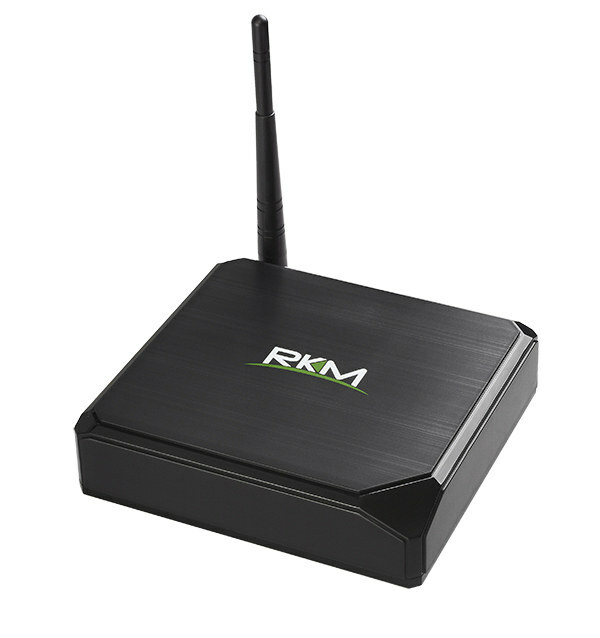 Connectivity – Gigabit Ethernet, dual band Wi-Fi 802.11 a/b/g/n/ac with external antenna (AP6335), and Bluetooth 4.0. The device ships with an HDMI Cable, a SATA cable, a USB Cable, a power adapter, a remote control, and a user’s manual. The company has filmed a video showcasing hardware video decode @ 1080p with VLC (VideoLAN), which appears to work pretty well. The platform also supports 4K in theory, but I guess it might not be implemented yet in their Ubuntu firmware, or they would have shown the capabilities. I’m not sure Kodi 14 supports hardware acceleration either with this setup, but it’s still good to see it working, at least with VLC. Both media players can be purchased on CloudSto for respectively for £124.99 (~$184 US) for MK80LE, and £154.99 (~$229) for MK80LE Plus including worldwide shipping by DHL. The Linux versions cost £10 (~$15) more compared to the Android ones, and although you could install Ubuntu yourself, Rikomagic Ubuntu version adds video hardware decoding, and is likely to include Exagear software to let you run x86 applications. However, you might be better off purchasing a low cost Intel Bay Trail-D or Bay Trail-M mini PC instead, as it should support all these features out of the box, and be as powerful if not more. Exactly! I really wonder about the usefulness and the market potential of all these “Yet-another-ARM-box” (YAAB) boxes that might or might not run Linux in a pretty way. With a price around 200 USD. I would say it’s too expensive for a HTPC, and too risky compared to other Intel hardware; I’m typing this on HP Stream 13 laptop (Intel Celeron N2840, 2GB RAM, eMMC, screen, keyboard), running Ubuntu 15.04 perfectly, and that all for only 219 Euro. I’m keen to buy a Linux box. But disappointed with lack of hardware acceleration on these devices. I have a rk3288 sitting at home gathering dust, I remember when rockchip said they’d support hw acceleration but it never came. I’m thinking about an Intel box more and more but price is always a factor together with power. Arm devices are usually a lot cheaper than intel and with recent arm SoCs they claim to do a lot more like [email protected] If only they could get their act together and release some proper firmware for Linux they could be a very good contender. I saw a rk3288 device for 70 usd and the cheapest intel bay trail I found was 100 usd. Another probable waste of money for some and as usual poor support for the device. Future Intel/AMD boards and chips will outshine and outperform these Chinese arm devices, and their costs keep improving. To some it is all about being against the big guys, supporting the underdogs. what intel mini PC do you suggest? And for that MK80LE, I think it costs a sh*tload of money that ain’t nobody gonna spend. pcDuino nano costs about 35$ with 1GB RAM and GHZ LAN. I wonder how much additional cost arises by using A80 instead of A20, adding a USB3 to SATA bridge, WLAN chip and 1 or 3 GB RAM? I dunno…the one spec I have noticed that directly correlates to my happiness with my experience is RAM. The more there is, the happier I am with the experience. I haven’t seen any 4GB embedded Bay Trail boxes, and a NUC with 4GB or more and a hard drive is getting a lot more expensive than this. It might be worthwhile for some people to grab the 4GB version, if they’re usage is like me and they are hungry for RAM. For me best device with excellent support on market and after sale service is WeTek Play, and i really hope that they will launch Quad core device soon, simply they have all what we as users need, 5 different roms, official android with regular update, openelec, enigma 2 and hardware acceleration of audio and video decoding is working. You should specify “cheap” in your list. I’d look at mini barebones. Your demands might not require all its properties. There are cheaper devices, if you don’t need fanless design, EPT, or VT-d etc. 1. There is currently no Baytrail based box running linux that you can buy off the shelf. 2. Taking a cheap baytrail based windows box from China and trying to shoehorn linux into it is not straightforward and when you finally do get it installed currently sound over HDMI won’t work and wifi will likely not work either. 3. The Chinese ARM boxes like the MK80LE and MK902IILE are more attractive to OEM buyers (eg digital signage companies) as when buying in bulk the price is way cheaper than the Intel based devices – remember that price on the Cloudsto website is for just 1pc and includes DHL shipping. For 179 USD you can get the HP Stream Mini: Celeron 2957U with Intel HD Graphics, and 2GB RAM (Upgradeable to 16 GB), 32GB SSD (M2 SSD drive), 4 USB 3.0, keyboard, bluetooth, Windows 8.1. A15 can play 1080p videos in software. All this video shows is a SD video with low CPU (but it’s SD), and that it can play 1080p video. I see no clear sign it’s hardware accelerated. Plus, it’s VLC. From what I know, VLC decodes using VAAPI and VDPAU – which XBMC also can decode. Is there a VAAPI or VDPAU wrapper for the VPU in A80? ECS LIVA (X) and HP Stream Mini are good options. Starts at $133 without storage / memory shipped by China post, and $200 with 4GB RAM, 32GB eMMC shipped with EMS. Both come with dual SATA, but I don’t think they support 2.5″ drives. I’ve recently built a small mini ITX HTPC using a mini ITX PC case with power supply, J1900 Biostar MB, 4GB RAM, 120GB SSD all for approx USD 150. Could be upgraded with future improvements of mini ITX intel/AMD motherboards and chips. Although slightly larger than the arm mini pc’s, it handles all I throw at it, its quite snappy, boots and running linux Ubuntu distro off a USB stick, Kodi-no problems and i’m finally happy. I’ll wait a long time before investing in an ARM HTPC again. Bay-trail-D and M are missing 265 support, even at 1080p. This means in about a year you’ll be force to upgrade to another system. This is the only reason to keep an eye on arms, but still a really important one…. I can’t imagine HP really pays that price, as it would only leave 77 USD for all others parts. So what does HP pay for the Intel Celeron 2957U? 50 USD? 30 USD? Less? More? Exactly! One of the reasons i use AMD Opterons on all my servers! Imagine a world without AMD and Intel’s prices would be sky high. Xeons are really expensive even now. I don’t like Rikomagic’s linux editions. Their previous effort, Picuntu, was obsolete even before the release, as Ubuntu 13.04 reached EoL. Furthermore, most ARM vendors (Rikomagic, Odroid, etc) never ever update the kernel with security patches, they tell you it’s a development board, and we aren’t gonna bother, or some such nonsense. So, to get better software support, I’d much rather pay for an Intel based device of the same form factor.